Descriptions of eight principles for making reading and math adaptations in the inclusive classroom. Successful adaptations should be part of a comprehensive plan for the student with disabilities. 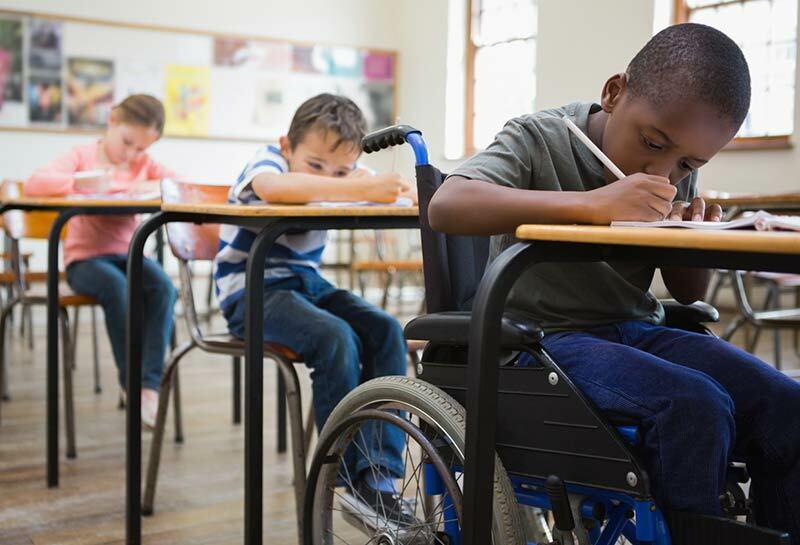 Classroom observations reveal that general education teachers do make some adaptations for students with mild disabilities. Most frequently, adaptations are made during a lesson when a student doesn't seem to be grasping a concept or mastering a skill. However, such adaptations tend to be idiosyncratic, incidental, and not part of a comprehensive plan for the student. While some on-the-spot adaptations are warranted, successful adaptations should be used routinely and be part of a larger plan to help students grow toward independence. Adaptations should also be planned in light of the goals set in the student's Individualized Education Plan (IEP). A makeshift adaptation may be overkill or inadequate when considered in this longer-range context. Also, an adaptation should consider the goals set by the state or district, as well as the assessment process for students with disabilities. View the Making Adaptations for Disabled Students chart to see a list of questions to use in creating intentional adaptations. Successful adaptations should benefit the student with disabilities and enhance, or at least not detract from, the learning of other students in the classroom. An adaptation should provide an educational benefit for the student with disabilities. However, some adaptations are just good teaching techniques that can be used with all students in the classroom. For example, study guides to help students read difficult information can benefit students at all achievement levels. When considering the selection of an adaptation, the teacher should also bear in mind the needs of students with language differences. If teachers have to make separate adaptations for students with disabilities and for students with language differences, they may be tempted not to make adaptations at all. Students with disabilities and those with language differences have unique learning needs, and teachers should not lump those differential needs into one package. However, many adaptations, such as graphic organizers, are recommended for both groups of students. To the degree that it is possible, teachers should implement adaptations that meet a wide array of student needs. Finally, a common issue confronting teachers is the “Robin Hood” effect. Some parents, teachers, administrators, and even students are concerned that adaptations require stealing time and resources from the “rich” (higher-achieving students) to give to the “poor” (lower-achieving students). The Making Adaptations for Disabled Students chart is helpful in selecting and implementing beneficial adaptations. Successful adaptations do not place undue attention on the student with disabilities or put the student in a potentially embarrassing situation. Parents, teachers, and students are all concerned about a child appearing different from other students. As much as possible, the adaptation should be a normal part of the classroom activities. Thus, it is important to think of the the questions in the Making Adaptations for Disabled Students chart when planning for implementation of an adaptation. Successful adaptations are continually evaluated. Once an adaptation is implemented, it needs to be evaluated periodically. The teacher should evaluate the adaptation to see whether desired results are being obtained. If the adaptation is helping the students achieve the desired results, then fading or perhaps elimination the adaptation may be appropriate. If it is not, then adjustments and alternatives need to be considered. The evaluation process should also engage parents, students, and, when possible, administration and support personnel. In some districts, support team and IEP meetings include the parents, teacher, resource teacher, administrator, school psychologist, speech pathologist, and others. During parent conferences the adaptation can be explained and reviewed to obtain parental input about the academic and social impact of the adaptation. Even very young students have definite opinions about what helps them learn and what does not. From time to time student evaluations of an adaptation can be conducted to find out what students think. Questions to guide thinking about evaluation can be found in the Making Adaptations for Disabled Students chart.